The Pt-Ni nanoframe catalysts have attracted great interest owing to their unique electronic structure and excellent catalytic performance. 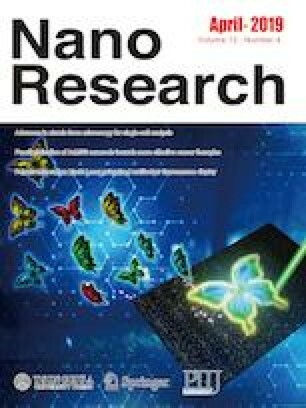 However, the stability of the tenuous edges of nanoframe-structures is dissatisfactory and their universal applications in catalytic market beyond electrocatalytic reactions are yet to be tapped and explored. Herein, we developed a new core@shell structured Pt-Ni nanoframe@CeO2 (Pt-Ni NF@CeO2) composite via etching the Ni from inhomogeneous Pt-Ni rhombic dodecahedra (Pt-Ni RD) by cerium(III) acetate hydrate (Ce(OAc)3). In this path, Pt-Ni RD was used as self-sacrificial template, while the Ce(OAc)3 serves as the provider of the Ce3+ source and OH− for the formation of CeO2 shell, etchant of Pt-Ni RD, and the surface modification agent. By this way, the etching of Pt-Ni RD and the formation of the CeO2 shell are simultaneously proceeded to form the final Pt-Ni NF@CeO2 in one step. 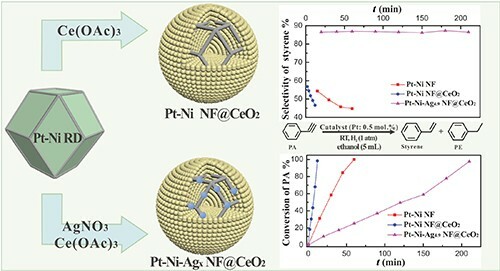 The obtained Pt-Ni NF@CeO2 exhibits strong interfacial charge transfer interaction between Pt-Ni NF core and CeO2 shell even without reduction treatment, leading to enhanced catalytic activity in the hydrogenation of phenylacetylene. After introduction of trace silver, the Pt-Ni-Ag4.9 NF@CeO2 achieves remarkable catalytic performance for the selective conversion of phenylacetylene to styrene: high conversion (100%), styrene selectivity (86.5%), and good stability. It reveals that encapsulation noble metal nanoframes into metal oxide to form core@shell structured hybrids will indeed enhance their stability and catalytic properties. Particularly, this work expends the application of noble metal nanoframes materials to hydrogenation reactions. SSupplementary material (additional synthesis methods, structural figures, and table of atom contents) is available in the online version of this article at https://doi.org/10.1007/s12274-018-2315-x. The authors are grateful for the financial aid from the National Natural Science Foundation of China (Nos. 21590794, 21771173, and 21521092), the project development plan of science and technology of Jilin Province (Nos. 20180101179JC and 20160520126JH), and CAS-CSIRO project (GJHZ1730).